The electrolysers are KOH (Potassium Hydroxide) based. KOH is similiar to NaOH (Sodium Hydroxide) found in household products such as Red Devil Lye or Drano. To see the MSDS (Material Safety Data Sheets) for KOH click here. 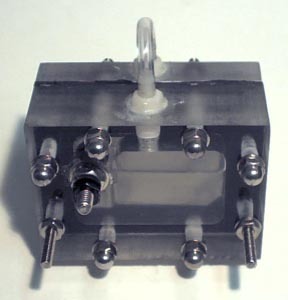 These electrolysers are a KOH type electrolyser. The is our newest design, built with HAAS CNC machined parts, it is made of clear acrylic, EPDM rubber, 316 stainless steel, 18-8 stainless and nylon hose barb fittings. The unit comes filled and sealed. The electrolysers are not designed to be taken apart, disassembly of the units will destroy the seperation membrane inside the electrolyser. Price is 109.95. To see input power test data for the Learning Kit Electrolyser click here. The electrolysers are KOH based. KOH is similiar to NaOH found in household products such as Red Devil Lye or Drano. 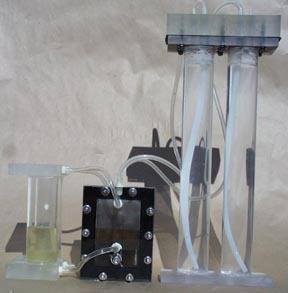 The electrolysers come in three sizes, 3, 6 and 10 watt hydrogen production. They use about 8 fl.oz. of KOH, and operate at less than 1 PSI. There are three parts to these electrolysers; the reservoir, electrolyser, and backpressure chambers. The power supply is not included. Voltage input should be kept between 2-3 volts, with 2 volts being the most efficient way to operate the electrolysers. The unit is tested and then drained. The unit is shipped empty. Complete test data showing operating voltage and current will be supplied. The electrolysers are not designed to be taken apart, disassembly of the units will destroy the seperation membrane inside the electrolyser. Price: 249.95, 349.95, and 449.95. E-mail for pricing and availability on larger units. To see the input power test data for the Low Power Electrolyser click here. The electrolysers are KOH based. KOH is similiar to NaOH found in household products such as Red Devil Lye or Drano. Basic safety precautions must be followed. 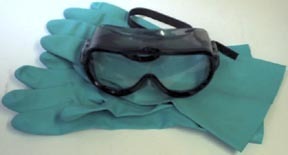 Goggles and gloves are the basic requirements for safety equipment when working with KOH. Price for goggles and gloves is 12.95. Please e-mail us with any further questions about hydrogen production and energy requirements. Please do not send attachments with e-mails without first contacting us. We will not open any unsolicited attachments to e-mails.